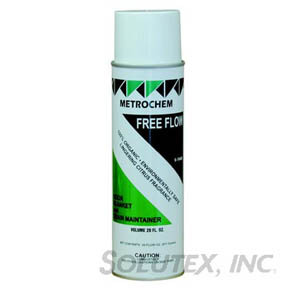 METROCHEM FREE FLOW CITRUS ODOR BLANKET 12/CNS/CS 20 OZ CANS - SOLUTEX, INC.
Use Free Flow to block sewer gas odors from coming up through floor drains. Free Flow floats on top of the water in the drain trap essentially blocking this water from evaporating. Free Flow synergizes drain openers in the removal of blockages in drains, toilets, grease traps, cesspools and septic tanks. It liquefies grease and leaves the area with a fresh, citrus scent. 100% organic. Environmentally safe. 12 cans per case.